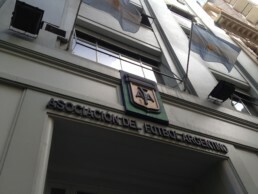 22.03.2012 – Today we visit the headquarters of AFA (Asociacion del Futbol Argentino), in Viamonte street, Buenos Aires. AFA, which was founded in 1893, is one the the oldest Football Associations of the world. Argentina is a 2x FIFA World Cup winner with unfogettable stars as MARIO KEMPES, DANIEL PASSARELLA (1978) and obviously the great DIEGO ARMANDO MARADONA (1986).